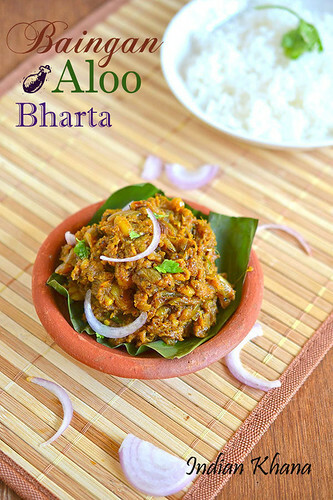 Baingan Aloo Bharta is another bharta variety which is delicious and if you like bharta then this is of course no exception. I started to make aloo baigan bharta by chance when once I was trying to utilize some left over boiled potato and from then it's has become regular and favorite. Potato gives texture to bharta and also we don't really have to use tomato too with this combination. 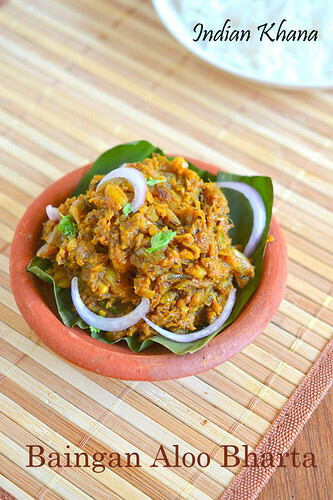 Bharta taste good when it's done in simple way without much of masala and also important thing in bharta is to cook the onion well for bharta to taste delicious, incase of using onion-tomato base then both onion and tomato needs to be cook well and that's makes bharta yum in all way. 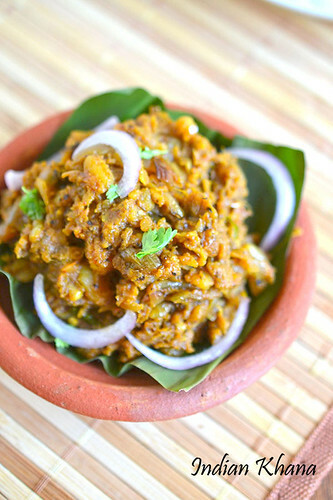 I make bharta a lot as it's favorite for everyone at home. Specialty of baingan bhart is it's goes well with roti, paratha and dal-chawal ie rice & lentil too very well. I like this baingan aloo bharta with both dal-rice and also with roti equally so what you want to pair this along is your choice. 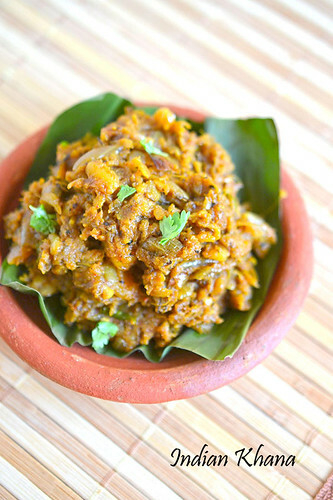 Roasted eggplant with mashed potato cooked in onion-tomato and spices for delicious baingan aloo bharta. Pressure cook potato for 3 whistles and while potato getting cooked, wash and make 3 large cuts around eggplant or baingan, stuff 1 to 2 in each slit, brush eggplant with oil well and roast in medium direct flame until skins turns black and eggplant becomes little soggy, do rotate eggplant in different directions in intervals. Once eggplant gets cool enough to handle, cut the stem, remove skin and mash it well (take out the roasted garlic). Also peel potatoes and mash them too. Peel and finely chop onions, green chilies, coriander leaves and finely chop roasted and raw garlic. In a pan or wok heat oil add garlic and saute until golden brown, add cumin seeds and allow to splutter. Now add green chilies, onion and saute in medium heat until onion becomes light brown and soft. Add red chili powder, turmeric powder, salt, kasoori methi mix well and cook for min, add mashed eggplant & potato, dry mango powder and stir well to combine everything. Cook for 5 minutes in slow flame, add coriander leaves mix well and off flame. Serve warm with roti, paratha or dal-chawal. Spicy bharta always taste good but you can adjust chili to suit your taste. You can also add 2 large chopped tomato after adding chili and turmeric powder and cook until mashed before adding eggplant, potato for variation. I like to add lot of garlic in bharta, you can reduce it too. That's an interesting add dear and wow! love the daal baati too. lovely idea, priti. must have tasted so good. Baigan aloo Bhartha looks delicious. Adding potato sounds yummy...looks tempting and delicious. That looks mouthwatering..i too add aloo in baingan bharta.. n it tastes awesome..
Love the addition of potato to eggplant,bhartha looks delicious. I must say I am feeling so hungry seeing all the delicious stuff in that thali ..dal batti and chorma and of course Baigan ka bharta ..simply delicious :-)..
wow, that is a great looking thali. I have never mixed baigan and aloo together, sounds great !!! Love this dish..looks so delicious..
Oh great combo and lt looks drooling!! Wow that sure is yummy. I 've never tried this version of baingain. Would love to try once. woow..pass me that plate..looks so delicious.. The whole platter is making me hungry now..Aloo in any form is welcome. In case we need to increase the volume, adding aloo is a good idea. The Bhartha looks great. Great idea! Nice como, both are my favs. Love this curry. You can add potato to anything and I will eat it! yum! I'm always happy to see an eggplant recipe, looks delicious! Wow wow wow.. these kind of platter omg i am drooling.. Priti make for me when i come to singapore. 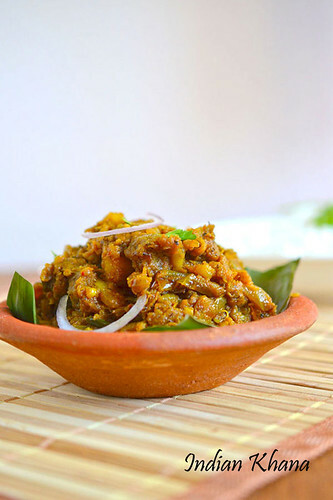 I never tried baigan bharta itself,The combo of aloo and egg plant...hmm..i am drooling here..
priti thats a very delcious baigan aloo bartha.. like the potato combo. sure taste so good.. Delicious thali. Began bartha is no to me and I love it. Thanx for sharing Prti. Its yum.